Posted 11/20/2017 6:10pm by Josie Hart. A box will be delivered on your front porch tomorrow during the day! Thanks for sending in your address, and THANKS again for all your support. From our families to your family - Happy Thanksgiving! Posted 11/16/2017 12:08pm by Josie Hart. We would like to say thank you for all your support this season. Please fill out our end-of-season survey, and let us know what you loved and what we can work on! We apologize for the auto reminders about distribution - they are turned off for good now. We are already missing having the fresh vegetables in our lives and are sure you are too. Phil's little Levy continues to grow and get stronger and we are all so happy to have a new farm family member. The farm staff is ready for a quieter, inward period where we can rest and reflect. We hope you all can do the same and we will see you next spring. We will deliver holiday produce boxes this coming Tuesday, the 21st. If you are not home during the day, do not worry, the items inside will be fine until the evening. Please email josie.hart@botanicgardens.org with your current address so we make sure you receive your Thanksgiving vegetables and other storage items. The Volunteer Party - Homemade door prizes and plenty of merriment! We haven't received any completed artwork yet for the CSA T-shirt project! Please consider making a sketch, painting, block print, photograph, digital design or other and send it in! If you don't have a scanner, you can drop it off with us and that will enter you to win the contest! From all of us at the farm, we wish you a Happy Thanksgiving and hope to see many of you at the volunteer party! Posted 11/1/2017 10:00pm by Josie Hart. Please ignore the auto-reminder for tomorrow's distributions. We are finished for the season. Thanks so much for all your support everyone! Posted 10/13/2017 12:50pm by Josie Hart. October 26, at the farm, we will have local makers bring their finest goods for sale. This is a great time to stock up on holiday gifts and items just for you - that were made by your farmers, veterans and friends. We have a talented bunch and this event is always fun. Warm cider and cookies will offered. Please join us (most of you have to in order to pick up your share!). - Mushrooms, bread, eggs and Balanced Belly Shares are finished. - Oct. 24 and Oct. 26 will be the last distributions. - Some of you still have balances on your account, you will be receiving a final bill, due November 15th. - Share Renewals will be available starting in January. You will have the entire month to renew your CSA share before we open sales to our waitlist. - Surveys - you will receive a link for our survey and we will have them available to folks at distributions. PLEASE fill out a survey - it's the only way we can learn and improve our operation. We appreciate the time it takes, we really do. We accepting original artwork to be the ace of our new CSA T-shirt! If you have a piece or want to create something that reflects our farm, community and produce, please enter! If your piece is chosen, you will receive a prize and a free T-shirt. Take a high quality shot of your art and email us! This Sunday we will send out a harvest list with weekly recipes. Posted 9/26/2017 1:46pm by Josie Hart. Our very own Chatfield Farms honey is available for sale starting today and will be for sale at distributions while supplies last. There are three types of honey this year: the light usually tastes the sweetest and brightest, the medium is the most full-bodied classic honey flavor and the dark honey is a complex, more savory or molasses-type flavor. Please limit two jars a person in the beginning until most members have been able to purchase the honey and then we can release the rest for final sales. Posted 7/21/2017 11:31am by Josie Hart. We are pleased to announce the date for our annual Farm to Fork dinner - please join us Sep. 9th at 5:30 p.m. in the Deer Creek Stables event area. Every year we bring in special partners to celebrate the peak season's bounty with a farm dinner and drinks. This is our way of saying thank you for supporting our CSA farm. We will send out an electronic invitation soon, so please mark your calendars now. When you RSVP, please let us know if you have any dietary restrictions. Posted 7/2/2017 3:45pm by Josie Hart. Happy Fourth of July! The corn for our maze this year is knee-high, and the farm is in full bloom! We hope you can come and take a look at all the beautiful gardens we have in addition to the vegetable fields. Are you ready for your holiday BBQ? Try out a healthy makeover to some of the standard BBQ side dishes such as kale chips and seared scallions with a spicy dip? Or how about mashed kohlrabi topped with aged cheddar? Of course there's always a simple fresh salad with thyme vinaigrette you can add to your menu as well. Whatever you do for your holiday meal, we hope our vegetables are nurturing and you enjoy the fresh flavors. July 15th from 9-5. this is a free event with live music, kids' stuff, food trucks, classes and so much more! Come see the blooming lavender and your vegetables! Organic Bing Cherries will be handed out to Tuesday shareholders - Thursday already received theirs. This is a great public garden story - as I was out weeding the flower beds that go into the bouquets for you all, i looked up and saw a woman with a huge grin and her camera staring at the ground. She was shouting in Arabic for her husband to come see what she was looking at. He starting shouting as well and they both on their hands and knees with smiles. They had discovered purslane! the woman was so overjoyed she had tears in her eyes. She is a doctor from Turkey, who had moved to the states and was living in an apartment. She doesn't have space for a garden and hasn't been able to purchase purslane in the grocery store. I explained to her that most Americans think of the plant as a weed they toss into their compost pile - she couldn't believe it! "This plant? It is packed with the most omega 3 fatty acids out of all the vegetables and has a ton of vitamin C. It is so good for your skin and tastes great!" She was so excited to see the plant that she offered to weed the flower bed with her husband. 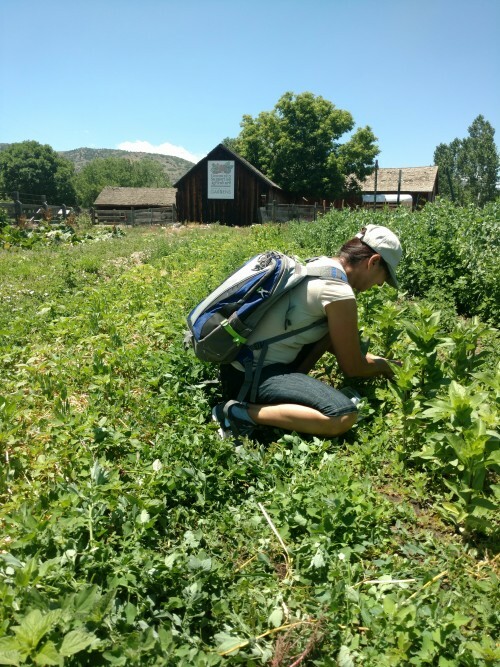 They filled up two bags of purslane and left us with recipes, stories and grateful smiles! Our friend puts hers on toast in the morning which is refreshing - but you can also use this like any tzatziki sauce. It's also great on strained chick peas with some extra mint leaves. And here she is, of course, with purslane in her mouth! Posted 6/29/2017 2:25pm by Josie Hart. A few updates for the holiday season: we are having distribution on Tuesday, July 4th. What a truly patriotic way to spend your holiday - supporting farmers! Additionally, today and next Tuesday we will be distributing our first round of organic Palisade cherries. Each fruit shareholder (separate from the veggies) will receive one bag of these juicy treats! Please remember to sign for your share. Have a great holiday - and we appreciate you being a part of our community. Posted 6/18/2017 1:27pm by Josie Hart. In our crop planning we try to incorporate the staples as well as crops which might be a bit off the beaten path. This week we'll be harvesting kohlrabi, which might be new to some. The name comes from the German Kohl ("cabbage") plus Rübe or Rabi ("turnip"), because the swollen stem resembles the latter, though it grows above ground. Kohlrabi is the same species as the wild cabbage plant (Brassica oleracea) but has been bred to have a giant succulent stem. The taste and texture of kohlrabi is similar to a broccoli stalk, but milder and sweeter, with a higher ratio of flesh to skin. Kohlrabi can be cooked as well as eaten raw, but on these hot days raw kohlrabi is so refreshing I much prefer it raw. See below for a really quick recipe which requires hardly any time at a hot stove, both important considerations now that the farm is in full swing! Mix garlic, cilantro, parsley, paprika, and cumin. Stir in lemon juice and olive oil. Mix with couscous, kohlrabi, and radishes. Add salt to taste. Makes 4-6 servings. Posted 6/9/2017 5:25pm by Josie Hart. The farm season is in full swing! We've got all of our big plantings in the ground- tomatoes, peppers, sweet potatoes, squash, cucumbers and more! This week we've still got the crisp, lovely spring harvests coming out of our recent colder months, and garlic scapes have just come on! Whether you know about garlic scapes already or not, get excited! They are the twisty, curly, tender green stems that shoot out from the garlic bulb and would develop into the flower if we didn't love to eat them so much! By picking them, we also redirect growth energy back down into the bulb so that it matures nicely, and we will enjoy those later on. 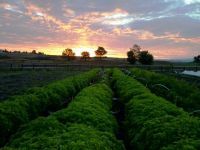 As the arc of the season develops, it's a beautiful opportunity to experience your connection to the land and your food. When we eat locally and seasonally, we eat well! York Street Shareholders - Pickup is at St John's Cathedral at 1350 Washington St. Denver,80203 on Tuesday, June 13 due to a concert at York St. the time is still 4 pm to 7 pm. 1. Set a large pot of salted water over high heat and bring to a boil. 2. Large sauce pan set over medium heat. Add a 2-count of olive oil and loose pork sausage. Cook over medium heat to render fat and get color on the sausage. Once the sausage is browned on all sides, remove and place onto a paper towel-lined plate. To the same pan, add the chopped garlic, red chili flakes, white wine, thyme leaves and cook until just fragrant, about 30 seconds to 1 minute. 3. Cook the pasta. (Add orecchiette to boiling water and cook). With about 3 minutes left, add the broccoli raab to the same pot and cook until tender. This is my favorite trick with broccoli raab - you don't have to cook it separately! You just throw it on with the pasta and kaboom! Enjoy greens that are tender and perfect for any Italian dish! Drain pasta and broccoli and place into the saucepan with the browned sausage. Drizzle with extra-virgin olive oil, season with salt and pepper, to taste, and stir to combine. Place into a large serving bowl. 4. Sprinkle with fresh Parmesan and parsley. Serve warm or room temperature. Notes from the field: A Visit from Colorado Ag Commissioner, Don Brown. This is Larry Vickerman, Chatfield Director and Josie Hart, Farm Program Manager picture with the commissioner. 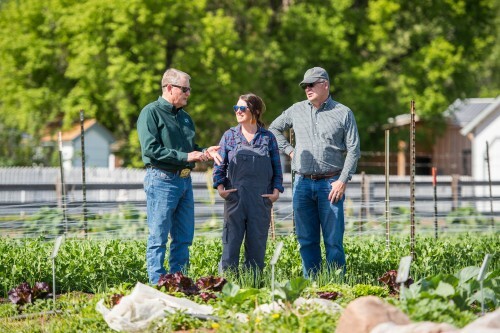 The Colorado Department of Agriculture's commissioner Don Brown made a visit to our farm last week! We took him on a tour of our CSA and Market Garden fields and he was very impressed - he had many positive things to say about our operation! The truly unique asset we have here is a combination of different types of farm production models - from high output market gardening at 1 acre to the mid- size CSA farm to the large scale corn and pumpkins, we are constantly working toward making our farm more educational and accessible to the public . The vets program that our Supporting Shareholders support, is incredibly lucky to have access to these different models for their education. If you have not made it down to the farm, we invite you all to come and see what we are up to! We had several dozen eggs last week that were not picked up at distribution. Please remember to look at your account (you can log in on our homepage) and make sure you are aware of what you purchased. Left over food gets donated to several local hunger-relief organizations in the Metro area - but we'd rather have YOU! This week don't forget to pick up, eggs, mushrooms and the balanced belly share. If you forget to pick up your shares, we can't accommodate you on other days - we are out in the fields and are not able to store extra or leftover produce throughout the week! Thanks everyone and here's to eating well!